U.S. Proprietary Medicine Co., 4¢ & 6¢ black, large die proofs, on India, stamp size with ample margins, 4¢ with margin nick and thin, otherwise Very Fine. Scott No. RS243P1, RS244P1 $350. U.S. Proprietary Medicine Co., 6¢ blue, trial color large die proof, on India mounted on card, stamp size with large even margins, fresh and Very Fine, ex-Joyce. U.S. Proprietary Medicine Co., 6¢ black, old paper, well centered, thins and small sealed tear at bottom, Very Fine appearance, very rare mint example of the U.S. 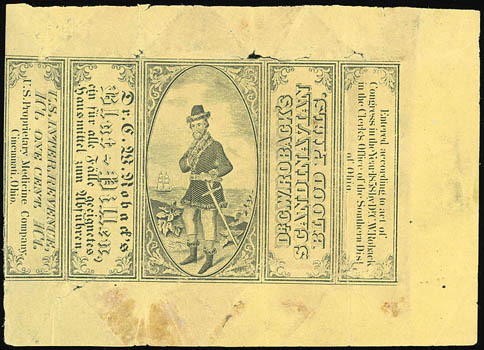 Proprietary Medicine Co. 6¢ Black on Old Paper, only twenty examples recorded in the Aldrich census (twelve are faulty). U.S. Proprietary Medicine Co., 1¢ black on orange, old paper, strong color, small internal tears and creasing, F.-V.F. 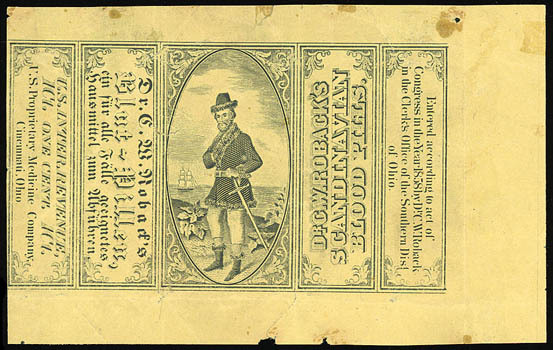 appearance, a scarce wrapper. U.S. Proprietary Medicine Co., 1¢ black on orange, old paper, strong color, usual flaws including couple small internal tears, F.-V.F. appearance, very scarce. U.S. 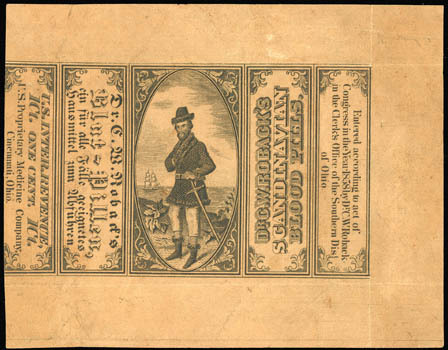 Proprietary Medicine Co., 1¢ black on orange red, old paper, bold color, cut slightly into design at left, usual minor wrinkling and folds, F.-V.F. appearance, very rare with only 16 examples recorded in the Aldrich census (of which 10 are reported to be faulty).